Anne Lawrence-Mathers: Manuscripts in Northumbria in the Eleventh and Twelfth Centuries. This wide-ranging study deals with book-production, libraries and library catalogues in the North of England during the eleventh and twelfth centuries, and it has more to offer than the title suggests, as the author generously provides several introductory sections on the political and ecclesiastical history of the time in order to outline the conditions under which the religious houses of the North acquired and used their books. 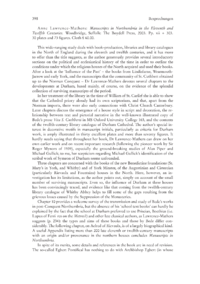 After a look at the Influence of the Past  the books from Lindisfarne, Wearmouth-Jarrow and early York, and the manuscripts that the community of St. Cuthbert obtained up to the Norman Conquest  Dr Lawrence-Mathers devotes several chapters to the developments at Durham, based mainly, of course, on the evidence of the splendid collection of surviving manuscripts of the period.